Bjorn Vang-Mathisen at Ocean Independence tells me that he's signed the central agency for sale of Alma, a 32m Azimut delivered in 2008. Bjorn's keen to stress her high level of specifications, saying that, "She offers the full package which not all Azimuts in this series have." The full package includes zero speed stabilisers, underwater lighting, upgraded A/V equipment, a teak sundeck and fore and aft fixed roller biminis. 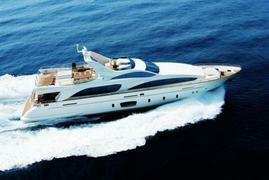 Sleeping eight guests in four cabins, Alma is asking €7.25 million.